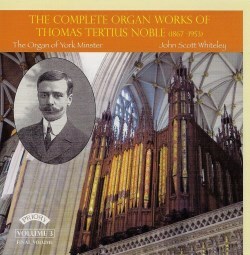 Among those composers who are remembered today for just one work is Thomas Tertius Noble, former organist of both York Minster and St Thomas’s Fifth Avenue New York. Those with an interest in English church music know of Noble in B minor, one of the classic settings of the Evening Canticles, but few know of anything else, except, perhaps, a handful of hymn tunes and psalm chants whose authorship usually passes unnoticed. John Scott Whiteley describes Noble as “one of the last of the great Victorian cathedral organists”, and clearly thinks highly enough of his stature as a composer to root out and record his complete organ works for Priory. This is the third and final volume of that series. As Whiteley points out in his extensive and extremely detailed booklet notes, Noble was very much a musical chameleon, “latching onto whichever currents of influence found their way into his life”. Certainly the 15 pieces on this disc show no common stylistic thread, and while they are all utterly typical of English organ music of the era, they lack any kind of distinctive voice. Add to that a sense that the craft of composition concerns Noble rather more than its results - as the late Arthur Wills so memorably put it in his published guide to the organ, referring to Noble’s French contemporaries, “the craftsmanship of their work is never in question, but the musical content is frequently too arid to interest musicians outside the organ world” – and we have here a disc of well written but ultimately unmemorable music. Possibly because it comes from a much larger work – a cantata written for York Minster in 1904 – the Solemn Prelude from Gloria Domini has a powerfully orchestral feel to it, and what it lacks in musical originality – it has more than a whiff of Elgar about it – it makes up for in sheer coloristic effect. As a prolific recitalist, Noble wrote several works for his own use, and for a major recital tour of the USA in 1913 he composed both the Elegy and Finale in D. On a large and resourceful organ (such as the one on which the disc is recorded) the former comes across as a wonderful kaleidoscope of colour and effect, but does not seem to offer much musical substance. While Whiteley suggests that the Finale in D pays lip-service to Vierne’s famous Finale, it has neither the melodic interest nor the general mood of excitement of his Parisian counterpart’s writing. Much of the remainder of the disc is given over to hymn tune preludes, indicating the practical origins of Noble’s organ music; although it remains an intriguing puzzle as to why so many of them on this disc are based on Welsh melodies. The Fantasy on Ton-y-botel, deals in quasi-operatic posturing and gloriously over-the-top melodramatics, overworking the tune’s hallmark motivs to an almost nonsensical degree, but the others tend to be soft and harmless, if occasionally Noble’s unwillingness to give up on a nice tune means they ramble on rather longer than is good for them. In the past Whiteley has devoted this kind of exhaustive energy in researching the music of a single composer and then committing it all to disc, to further the cause of the Belgian Joseph Jongen, and today we owe a debt of gratitude to him for having exposed a composer whose previous neglect now seems quite unjustified. Whether in a few decades we shall say the same about his resurrection of Thomas Tertius Noble remains to be seen. I can’t see it, somehow, since this music is so devoid of individuality or real personality. That said, Whiteley’s fluent and energising performances on the splendid York Minster organ, and Priory’s absolutely first-rate recording of it, present Noble’s organ music in as fine a light as it is ever likely to receive. It is up to the musical public to decide whether Noble’s place in history remains that of a one-work composer.